After living in isolation in my wife’s office during his first two weeks with us, we slowly let Boo expand both his contact with the other pets and his exposure to the rest of the house. He was more than ready to start exploring but still rather nervous about it and sought out safety zones where he could retreat when he got overwhelmed. He soon discovered the gap behind the washer and dryer could fit a Boo but not a Boolie. 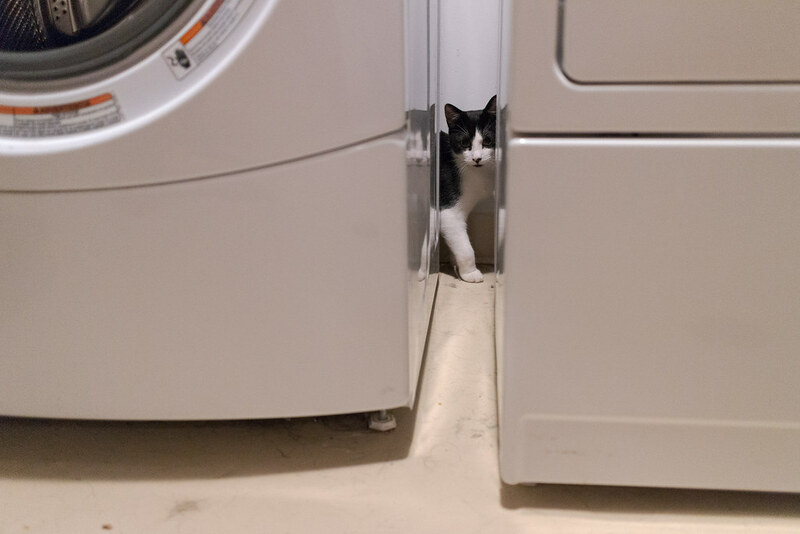 This entry was posted in Pets and tagged black-and-white cat, Boo, cat, hiding, kitten, laundry room. Bookmark the permalink.